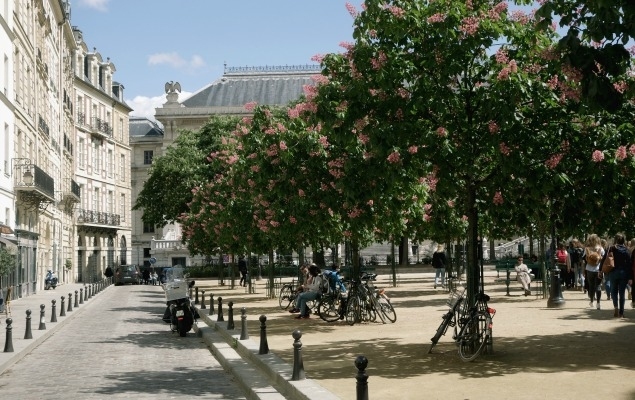 Take a break from sightseeing and enjoy the charming atmosphere of Place Dauphine. Located in a at the tip of the Ile de la Citï¿½, this quiet little corner of Paris offers respite from busy city life. 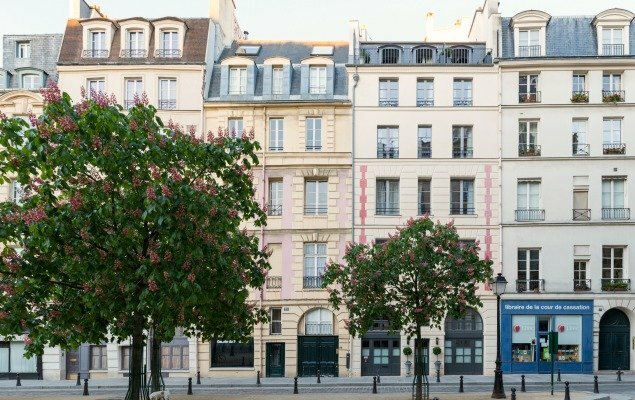 Tucked away on the western tip of the Île de la Cité, Place Dauphine combines all the beauty and romance of Paris into one beautifully historic square. This leafy gem in the heart of the City of Light is lined with quintessentially Parisian buildings, art galleries and cafés, not to mention lovely little cobblestone streets. 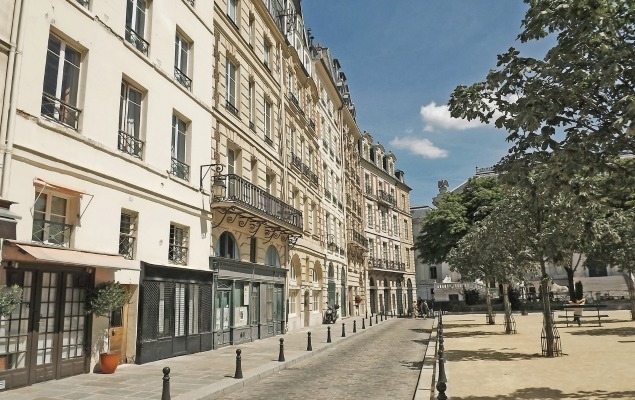 Rich with history and overflowing with ambiance, Place Dauphine is a charming and cozy outdoor space offering respite from the hustle and bustle of busy city life. A popular destination for couples, authentic Parisian atmosphere is alive and well at Place Dauphine, and no visit to the Île de la Cité is complete without taking a stroll through this beautiful little slice of Paris. One of the prettiest squares in Paris, Place Dauphine is the perfect place to take a break during a day of sightseeing. 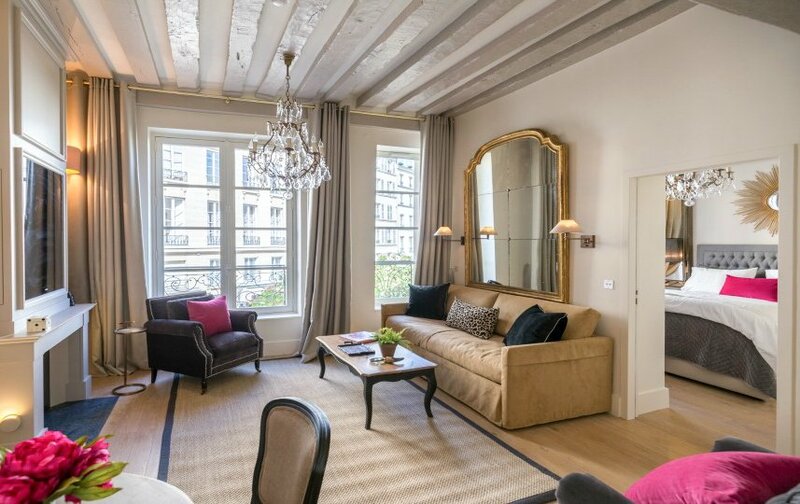 Conveniently situated in the very center of the city, moments from Notre Dame Cathedral and Pont Neuf, the square is actually in the shape of a triangle. The thick walls of the buildings surrounding the space on three sides provides sound protection and contributes to Place Dauphine’s tranquil atmosphere. In addition its to idyllic park space, a handful of charming cafés and restaurants line the square, and offer ideal spots for enjoying a leisurely lunch or a cafe au lait. The cafés and restaurants lining Place Dauphine are each charming in their own way. Offering gourmet coffees, fine wines and plenty of authentic Parisian fare, they are favorites with laywers working at the Palais de Justice lining one side of Place Dauphine. Which means they meet their very high requirements of excellent food! Reaching Place Dauphine couldn’t be easier. The most scenic route is from Pont Neuf Metro Station. 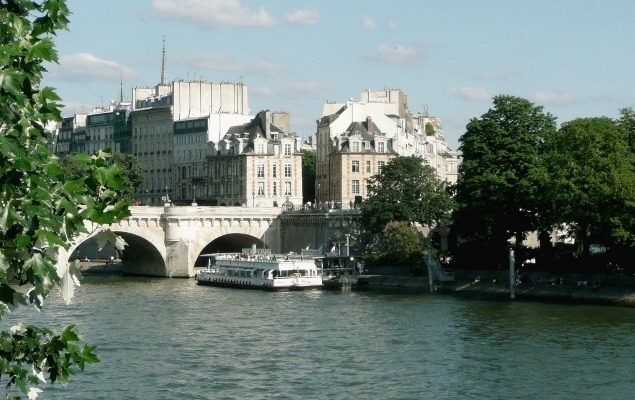 Simply walk along Pont Neuf, the oldest bridge in Paris, and take Rue Henri Robert straight into the square. Alternatively, you can reach Place Dauphine after taking in the sights of the Île de la Cité. Start with Notre Dame Cathedral and work your way west towards the Sainte-Chapelle and the Conciergerie. 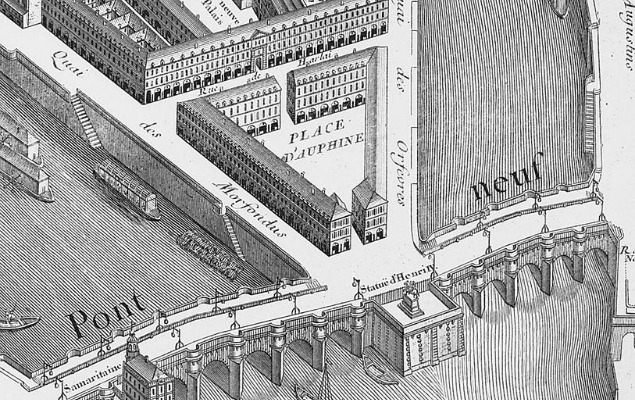 At its most narrow end (the tip of the triangle), Place Dauphine converges with Pont Neuf. The point is marked with a grand equestrian statue of Henri IV. Take a moment to enjoy the views of the Seine and the city from here. If you look in the distance, you should be able to spot the Eiffel Tower, along with the Pont des Arts and the Louvre Museum. Place Dauphine is not large, but its unique size and hidden away setting add to its charm. The park benches dotting the square are the perfect place for a mid-day picnic after a busy morning exploring the Île de la Cité. Place Dauphine is an ideal spot to sit back and enjoy the people watching. You’ll see locals strolling by with their little dogs in tow, children playing ball games and other scenes from everyday life. It's easy to imagine the Parisian lifestyle from another era while sitting in peaceful Place Dauphine! Place Dauphine was one of the first projects commissioned by Henri IV. After the completion of Pont Neuf in 1606, the king wanted to make use of the three acres of undeveloped land on the western end of the Île de la Cité. Plans for Place Dauphine were drawn up between 1607 and 1610, and included rows of houses with matching facades built around a triangle structure. Remarkably, this general layout has remained unchanged for over 400 years. Another rare feature of Place Dauphine is that the buildings were built for merchants and commoners rather than the elite like other architectural developments of the period like Place des Vosges. The equestrian statue of Henri IV located on Pont Neuf near the entrace to Place Dauphine was installed in 1614, and the last of buildings enveloping the Place Dauphine were completed in 1616. These buildings were originally just three storeys tall, consisting of two ground floor shops in each unit, two floors of residential space and a small attic space. Over the years a vast majority of the buildings have been heightened and extensively remodeled, with the exception of the two noticeably shorter units located closest to Pont Neuf. Stay on Place Dauphine in Paris! 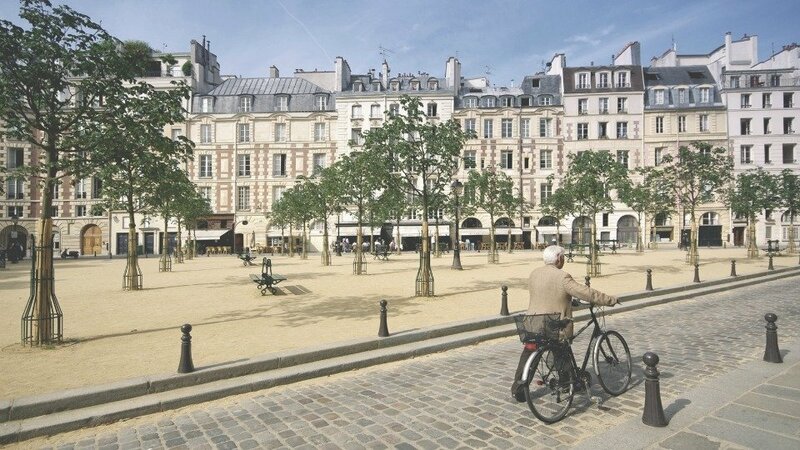 With its peaceful setting and hidden away charm, Place Dauphine is one of the most romantic spots in Paris. 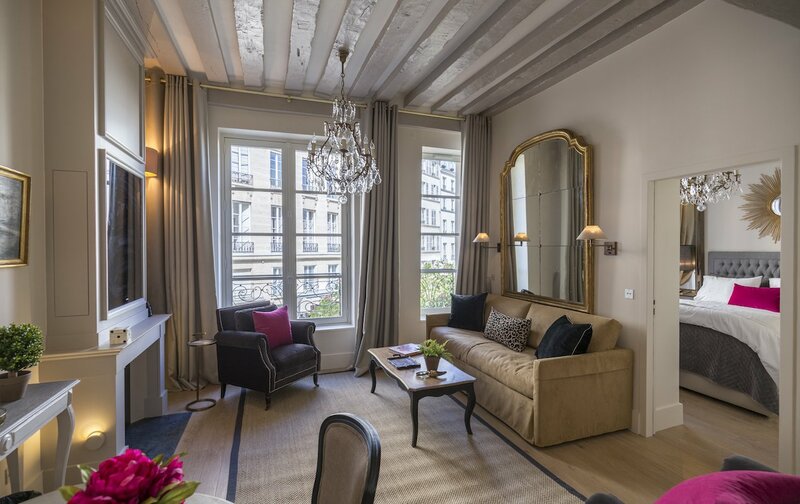 Savor the historic ambiance of Place Dauphine with a stay at our flagship location 25 Place Dauphine, a stunning 17th-century building that has been lovingly transformed into seven gorgeous vacation rental apartments. Enjoy strolling to beautiful Notre Dame Cathedral, the stunning Sainte-Chapelle and exploring the beauty of the Île de la Cité and Île Saint-Louis islands. You'll be just moments from all the top landmarks and museums in Paris during your stay at 25 Place Dauphine! 25 Place Dauphine Featured on Fathom! Welcome to 25 Place Dauphine – the Finest New Address in Paris!